The Barking branch of the Ahmadiyya Muslim Elders Association (AMEA) joined mayor Cllr Eileen Keller at the event on Wednesday, where £92,590 was given to the Royal British Legion. 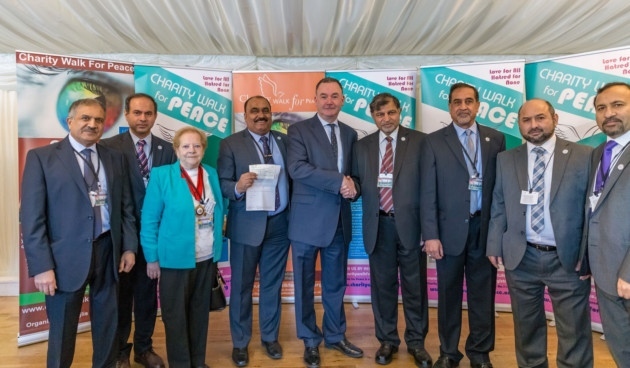 The funds were donated after the AMEA’s Charity Walk for Peace in November raised £250,000, with AMEA spokesman Samiullah Tariq saying the group match-funded the total to help charities across the world. At the ceremony, which Dagenham MP Jon Cruddas attended, £4,000 was given to West Ham United Foundation and £2,313 to Richard House Children’s Hospice. Share the post "Barking walk for peace raises £500k for needy"